PAKISTAN: Can a security contractor claim diplomatic immunity? 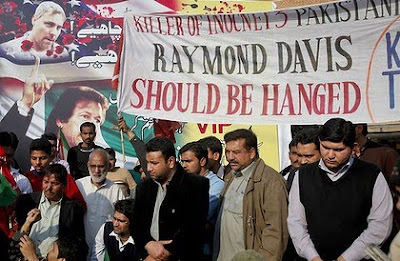 There's a chap named Raymond Davis currently in a prison cell in Pakistan. He was in the country as a private contractor working for the Central Intelligence Agency (CIA). David was arrested after he gunned down two men in Lahore. A third person was run over by a US Consulate vehicle. Davis, a US official, was arrested in Lahore Jan 27 after he shot dead two youths on a motorcycle. He claimed he acted in self-defence as the armed youngsters were trying to rob him. His arrest has sparked a diplomatic crisis and strained relations between the US and Pakistan. The US has threatened to withhold the $1.5 billion aid package promised to Islamabad for the war on terror. Views in Pakistan are ... well ... to put it mildly, quite strong. Here is what one columnist, a retired vice-admiral and former vice-chief of the naval staff, wrote in The News. What sort of “strategic relationship” do we have with each other if America has let loose a horde of CIA operators in this country and is working towards its destabilisation. The US position is that international conventions cannot be subservient to the laws of a signatory country. The Vienna Convention on Consular Relations was intended to specify the privileges of a mission to enable its diplomats to perform their function without fear of coercion or harassment by the host country. It is ironic that in the Davis case this convention has been turned on its head against the host country, for use as a legal cover to protect an American who committed first-degree murder. For Pakistanis, many of whom are angry at the apparent impunity with which the C.I.A.’s drone missiles regularly kill terrorism suspects — and, at times, innocent bystanders — Mr. Davis’s case has proved galvanizing. Protesters have called for Mr. Davis to be hanged. ... this case also rests on legal technicalities, with confusion arising from contradictory statements by the State Department in the first days after Mr. Davis’s arrest. Those statements have called into question whether Mr. Davis was working — officially, at least — as a diplomatic official or a consular one. Consular officials are afforded somewhat weaker legal protections because they are thought of as administrators, rather than diplomats. Initially, State Department officials described Mr. Davis as a staff member for the United States Consulate in Lahore. Days later, however, the United States government said that Mr. Davis was actually listed with the administrative and technical staff of the United States Embassy in Islamabad — and that it had formally notified the Pakistani Foreign Ministry of his status there on Jan. 20, 2010. The distinction is crucial. If Mr. Davis was listed as a technical staff member for the embassy’s diplomatic mission, then he would be covered by a 1961 treaty that gives diplomats total immunity to criminal prosecution. In that case, Pakistan should be allowed only to expel him. Victims’ families, however, might still be able to sue him for civil damages. The contradictory statements over Mr. Davis’s assignment are just part of the evidence that Pakistani news accounts have cited in criticizing the United States’ position. I'll have to dust off my public international law textbooks to come up with a definitive answer to this one. Treaty interpretation isn't easy. The rules of international law are not like common law where clear rules of interpretation and construction apply and where case law usually provides clear guidance. Precedents are not binding in international law but are only a guide. What really matters is international consensus of what the legal position is i.e. customary international law. Of course, law aside, this case illustrates just how tricky it is for countries like the US that make extensive use of private contractors for off-shore intelligence and defense work.